South Florida has one of the best climates in the country! With annual average temperatures ranging from the mid 60’s in the winter to the mid 80’s in the summer. While you bask in the South Florida sun and enjoy our spectacular climate, you can also take advantage of the outstandingly unique and modestly priced lifestyle which Kings Point offers, including an extensive selection of professionally maintained and opulent recreational amenities, convenient transportation, 24/7 security services and, most importantly, EXCELLENT VALUE! Kings Point is convenient to everything you may desire. Being in close proximity to the beach, Kings Point is attractively located near the intersections of Atlantic Avenue and Jog Road as well as Linton Boulevard and Jog Road in Delray Beach. Neighboring many shopping centers, dining, movie theaters, entertainment, medical facilities and numerous houses of worship. Kings Point consists of 7,200 condominium residences in one or two story buildings. Every two story building offers a lift or elevator making them extremely accessible. Most of the available residences have lake, golf, pool or garden views and offer spacious floor plans from 726 to over 1,100 square feet. Our convenient daily transportation services are INCLUDED in the maintenance fees of your condominium and provide a valuable added benefit for many of our residents who use them to travel both inside and outside the communities. With 24-hour gated security entrances and regular roving patrols, you’ll feel comforted with piece of mind at Kings Point. Our community’s 78 different Condominium Associations are all privately managed by their very own Boards of Directors, most of which have retained the professional services of a licensed Property Management Company to run their daily business. The centerpiece of our community is the marquee Main Clubhouse, with over 100,000 square feet of entertainment, education and other recreational space, exclusively for the enjoyment of our residents! For sports and physical fitness enthusiasts, we offer state-of-the-art fitness facilities, 6 swimming pools, 2 golf courses and 8 tennis courts. 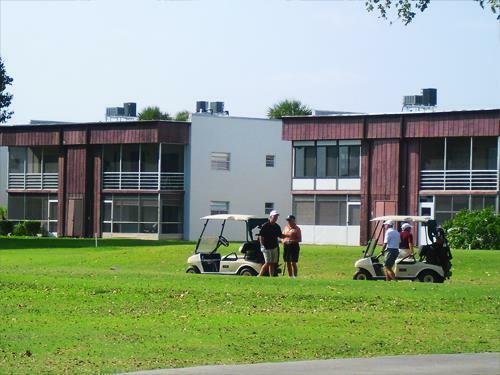 Kings Point also features 2 other ancillary Clubhouses with several other activities and services available. With over 100 Broadway-style live shows per year, current movies, computer courses, arts and crafts and so much more, Kings Point has more than you can imagine! Some of our residents’ favorite parts of the Kings Point lifestyle include our very own Café, Beauty Shop, newspaper “The Kings Point News and Revues” (the most current edition can be read and downloaded if you PLEASE CLICK HERE, which is operated by the residents and excellent transportation service. Additionally, our residents enjoy lakeside model boat racing, shuffleboard, over 100 different clubs and organizations, plenty of BBQ and picnic areas and everyone is looking forward to our brand new Bistro Restaurant, which is coming soon. Other community features include ample guest parking, we are right next door to Delray Medical Center and convenient to historic Downtown Delray Beach! All of our condominiums are CORNER UNITS and almost every condo has its own washer and dryer connections inside of it making laundry extremely convenient and CENTRAL A/C for everyone in each condo! Check out all the Clubs and Organizations at Kings Point waiting for you to enjoy! PLEASE CLICK HERE. Over the nearly 10-years that Kings Point was constructed, the community custom tailored specific amenities to ensure the 110% satisfaction of all of our valued residents. On the subsequent pages of our website, you can learn EVERYTHING you want to know about Kings Point and why our neighborhood continues to be one of the most desirable retirement communities in South Florida. To visit The Kings Point Clubhouses’ Main Website Page for additional information, PLEASE CLICK HERE.